Gov. Andrew Cuomo signed legislation Saturday to lower New York City's speed limit from 30 mph to 25 mph, saying slowing down will cut down on pedestrian and motorist deaths. 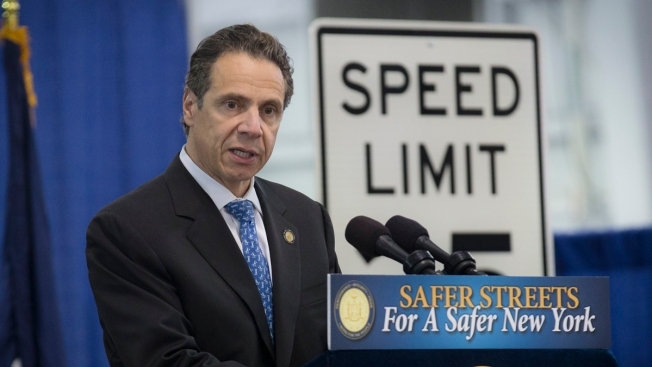 Cuomo was flanked by two traffic signs that read "Speed Limit 25." "New Yorkers are fast, New Yorkers like to do things fast, everything is time, everything is pressure, but this says slow down and save a life," the governor told an audience that included families who have lost loved ones in traffic accidents. "New York has a crisis when it comes to pedestrian deaths." Last year, the city had 176 pedestrian deaths. Cuomo called that a frightening statistic and said a speed reduction of even 5 mph cuts in half the likelihood of being killed. The new limit is expected to go into effect in three months, once the city approves its own law formalizing the rule. The legislation is part of Mayor de Blasio's "Vision Zero" plan to try to end traffic deaths in the city. In a statement, the mayor said: "This is a great day for the families, advocates and officials who have worked so hard to protect their fellow New Yorkers." Cuomo noted that while the new limit "makes sense in some places, it doesn't make sense in other places." He said local communities will have to consider any exemption. Overall, the number of people killed in city traffic accidents has increased by about 15 percent in recent years, officials said.